The Maruti-Suzuki Ciaz is Maruti’s most convincing attempt at going upmarket. So, just how good is it? We do our Maruti Ciaz Review to find out just that. A couple of years ago, we came up with a slightly unusual story idea – as we tend to do here at autoX. We had the audacity to take on the biggest and brightest star in our galaxy. The machines for the task weren’t exactly intergalactic though – they included the Mercedes-Benz GL 350, Volvo S60, Honda VFR, and the Maruti-Suzuki Kizashi. And while the two-wheel, 1,200cc VFR was pretty impressive – especially with its automatic transmission – the standout for me was the Kizashi. I had heard that it was a drivers’ car, but I didn’t quite expect it to be as adept at canyon carving as it proved to be in the foothills of the Himalayas as we attempted to complete a 600-kilometre journey from Delhi to Kasauli, and back, in one day – all the while racing the sun across the sky, from sunrise to sunset! Suffice to say, we lost – badly, thanks largely to road works – but the Kizashi left quite an impression. So, I was disappointed to say the least when I heard that the Kizashi met with little success – not only in India, but globally as well. I even considered hunting down one of the last few units when Maruti announced a massive price drop to shift the remaining few that the dealers still had in their inventory. It was, after all, a CBU (i.e. it was a complete import), and was pretty pricey as a result. And this wasn’t Maruti’s first attempt at moving upmarket. They tried with the Vitara – which, again, is a fantastic product, but suffers from many of the same ailments as the Kizashi. It’s expensive – since it’s also an import. It doesn’t have a diesel engine. But, most of all, what’s held these cars back – even the likes of the Baleno and SX4 – has been the fact that Maruti has been unable to break the glass ceiling that shrouds its brand. It has immense brand value in the country – it’s very much our peoples’ car! Most likely, it’s your first, second, and maybe even your third car, but then it’s a stepping-stone to something better. 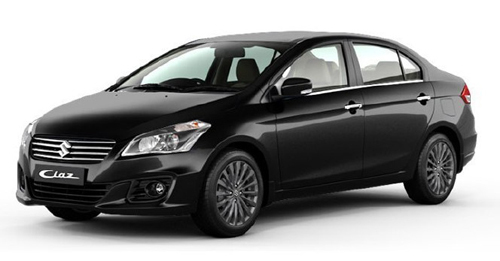 Well, their latest launch – the Maruti Suzuki Ciaz – very much aims to be that something better. Read on to know how did it perform in our Maruti Ciaz Review. The stunning Maruti Suzuki Ciaz concept set the ball rolling earlier this year at the Auto Expo in Greater Noida. Admittedly, the production version of the car that you see here isn’t quite as outlandish, but it’s still a good-looking machine. And it has to be if Maruti is to succeed in this segment! The risk that you run with showcasing such a striking concept in the first place is that people are inevitably disappointed when the final product is unveiled – which is why, nowadays, you tend to see production cars that look very much like their concept avatars. And vice versa for that matter – production cars that push the limits to retain the novelty of their initial concepts. But, back to the Maruti Suzuki Ciaz – which is anything but disappointing, despite being slightly toned down when compared to the concept. During our Ciaz Review, we also realised that the front end is striking with a massive Suzuki ‘S’ held in place by a slatted chrome grille that makes quite a statement. It has a pair of large headlights that accentuate this, and every variant in the line-up gets projector headlamps – the detail in the headlight casing looks quite impressive as well. In profile, the Maruti Suzuki Ciaz gets a couple of sharp creases and a really nice set of anthracite multi-spoke alloys. It’s in the rear, however, where the originality of its styling seems to take a hit – as the tail lamps bear a striking resemblance to that of its main rival, the Honda City. Where the Maruti Suzuki Ciaz scores points over the City in our Ciaz Review, however, is in terms of road presence and sheer size. It’s almost 4.5 metres in length, and has a wheelbase of 2,650mm, which means that legroom is plentiful for rear passengers. It would be nice, however if the rear bench provided a little more under-thigh support. Where the Maruti Suzuki Ciaz scores once again, though, is in terms of cabin quality. While there are some questionable pieces of trim, and quite a few hard plastics, the overall quality and layout is quite impressive. Our test cars were all in ZXi+ trim, which is the highest trim level available – and they were outfitted with a 7-inch touchscreen infotainment display that’s been developed by Bosch for Maruti Suzuki. It not only syncs to your phone, but also provides navigation and a reversing camera that has surprisingly good resolution. The trouble is that, while Maruti insists that it’s future-proof, it’s not quite 100% ready at present! I had some trouble pairing my phone to the in-car entertainment system, after which the system crashed and refused to come back on. Once it was fixed, however, the Navteq-powered navigation device came to good use outside Jaipur where we were testing the car – except for the fact that the lady in the navigation device sounded a bit like your headmistress from junior school. She was more than a little firm when saying, “Take a U-turn if possible!” The engineers at Maruti insist, however, that all these small niggles will be resolved before the car is launched in October this year. Well, all the practical niggles anyway – I have a feeling that the headmistress might be here to stay! We also noticed some nice touches in the rest of the cabin as well during our Maruti Suzuki Ciaz Review. The passenger side seatback has a nifty cell phone sized pocket for your – well – cell phone. The rear passengers get the benefit of a pair of AC vents. For the driver, though, it would have been nice if the steering adjusted for reach as well as rake. At present, the steering is only height adjustable. I could have done with a sunroof as well, although it’s not exactly a deal breaker without. What would be a deal breaker, though, is if the drivetrain struggled to cash cheques that the looks have very clearly issued. There are two familiar power units here – the 1.4 litre K-Series petrol engine and the 1.3 litre diesel sourced from Fiat. Both engines are tried-and-tested, but their power outputs of about 90 horsepower apiece doesn’t exactly set the spec sheets on fire. So, how do they fare out on the open road? The petrol engine has been reworked to reduce friction losses and improve mileage. Fuel economy claims for both engines, in fact, are pretty impressive – if not a little optimistic. The petrol is claimed to deliver 20.6km/l, while the diesel is rated at a class-leading 26.3km/l. The petrol engine has also been lightened with a cam cover and other components in plastic – so much so that the petrol variant of the Maruti Suzuki Ciaz, thanks to an all-new platform, weighs 160kgs less than the much smaller SX4 before it. The engine itself is extremely refined and smooth, even when you rev it all the way to its 6,500rpm redline. Thanks to its free-revving nature, it provides adequate performance – but it’s the diesel engine that feels far more punchy going down the road since it develops it’s torque lower down in the rev range. It does have a little bit of turbo lag, but, once again, it’s a very refined power unit. The insulation in the cabin is quite good, so any engine noise that does make it’s way into the car is actually quite pleasing – it certainly has better insulation than the Honda City. But while the performance is adequate, it won’t set your heart on fire. Perhaps Maruti has taken a lesson from the Kizashi and focussed more on comfort and refinement rather than driving pleasure. While the steering in the Kizashi was sharp and direct, in the Maruti Suzuki Ciaz it’s a bit vague. While the body control in the Kizashi was very impressive, the focus on the Maruti Suzuki Ciaz is on ride comfort rather than handling. As a result, it completely insulates the cabin from the undulations of the road. The gearbox loses the precise rifle bolt shift quality of the Swift and SX4, which made them feel like real drivers’ cars. Here again, the focus is on comfort. The clutch pedal is extremely light, and moving the gear level from one ratio to the next is a bit like slicing a hot knife through butter. The petrol engine will also get an automatic transmission, but we weren’t able to get our hands on one to tell you how it feels going down the road. Of the two cars that we did drive, the lasting impression was that of comfort – resulting from the space and refinement inside the cabin, and an equal amount of comfort on the move thanks to an extremely competent chassis and complaint suspension. With the Maruti Suzuki Ciaz, the viability of a premium sedan from Maruti seems like an idea whose time has come. With the help of its Japanese engineers, Marutic Suzuki appears to have focussed keenly on the needs of our market. And they appear to have got it spot on. The Maruti Suzuki Ciaz feels grown up – it’s refined, and has great road presence. But, most of all, it feels upmarket. The Honda City, I would imagine, is already having sleepless nights!